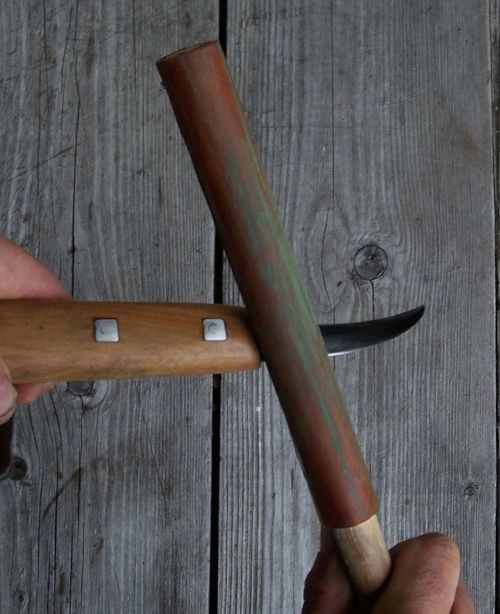 A step by step instruction on how to sharpen a crooked knife, crook knife, bent knife or hook knife. An easy DIY guide on bringing your blade edge to a razor 's edge. The tangs are level with the bottom of the handle for easier sharpening control. You can start by placing the knife on the stone flat on its back. 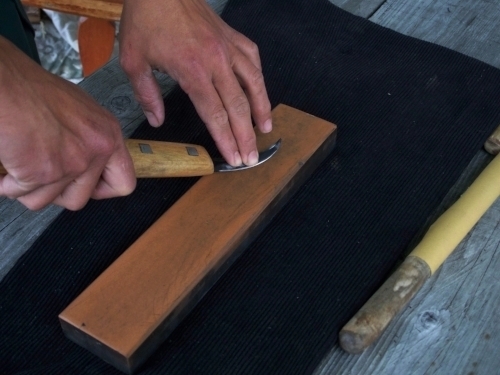 Sharpening your crooked won't be difficult but you will need patience and a bit of practice . Stay relaxed. The crooked knife is flat and snug on the stone with light pressure. Keep pressure on at 60%. On a slight angle pull back and roll slowly on the hook. Drag flat rolling along the hook to the tip. Drag the dowel, following the bevel, the length of the blade and the dowel. Repeat on the left bevel. Repeat the process with at least 2 more finer grades of sandpaper tight on dowel. Both sides. Equal counts and full lengths. Strop the blade flat on the leather and pull straight back. A set of five handmade crooked knives. Sharpening hooks made easy. First clean up the back of the crooked knife blade. Place the back of the blade flat on your stone. You are not trying to take off much material. Just burr. Clean-up. Firmly press the blade onto the stone with your fingers keeping it true and flat on the stone. Some of the hooks on our knives are hollow ground on the back so you just want to get any burr off. The edge is aggressive. Begin to drag the blade back, right side edge angled at 60%, down the stone. Begin pivoting the end of the handle up so that the hook curve follows on the stone and you sharpen the entire edge. Lightly shave the rock while keeping your blade firmly pressed flat. Pivoting the handle up and following the hook. Again, time your drag so the whole edge will make contact for the length of stone. Always keep pressure down against the stone with your fingers. With each pass, very lightly shave the length of the stone following the hook until you come off the stone at the tip of the blade. Repeat these actions for the left edge. On a piece of dowel (eg. 35 cm of broomstick) tightly wrap a piece of 600 grit no - fill or wet/dry sandpaper so that you may clean it and re-use it over and over. Secure the paper onto the dowel with three staples. You can buy this type of sandpaper at any autobody shop. Begin with one end of the sanding dowel on the base of the edge and stroke outward, using the whole length of the sandpaper with each stroke on the whole length of the crooked blade edge right to the tip and off. Continue stroking. This will create a burr on the back. Repeat step 1 just to take this burr off. If you are removing material because of damage step 2 is where one does it. The idea is to wear/sharpen the edge down from the top side (the inside), take the burr off and fine tune the edge from the back. Always stroke at the same angle following the bevel. Cone shaped stones are also an excellent choice for sharpening your hook knife bringing your edges flat after repeated sharpening and honings with dowel sticks. Using contact cement, glue a piece of 6 or 8 oz leather around a 1.25 cm (1/2") dowel. 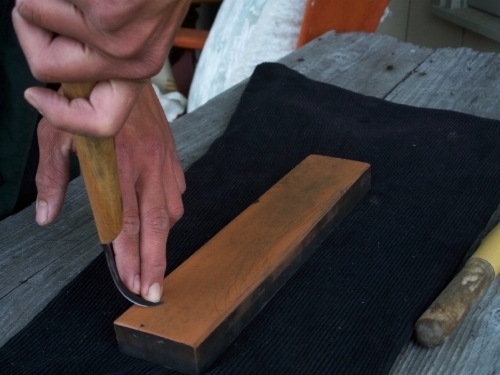 Rub jeweler's rouge or a fine honing compound into the leather and strop the edge. Inside and outside. Follow the bevel on the inside and keep your blade flat for the outside hone. Tip: drill a hole in the handle of the dowel, hang it from your belt for a hone while your carving. Sharp hook knives. 2 large hook knives with butternut handles. Both knives are 14 inches overall. Please visit our Crooked Knives page.